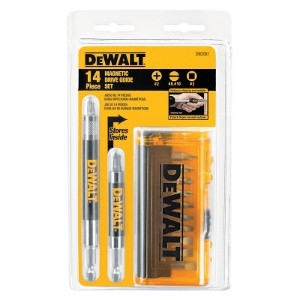 DeWalt Drive Guide Set 14 pc. Bit Size: Multi Size in. Shank Diameter: 1/4 in. Number of Pieces: 14 pc. Shank Type: Hex. Includes: (2) Magnetic Drive Guides, (6) #2 Phillips, (2) #8 and #10 Slotted, (3) #2 Square Recess Bits, (1) Case.